lt was nearly two decades ago that members of the Brighton and Hove Archaeological Society joined Geoff Bennett of Brighton and Hove City Council (BHCC) in initiating the clearing up of fly tipping at Whitehawk Hill. The hill was littered with rubbish, mattresses and even hypodermic needles. When these last items were found, the clearance passed to BHCC and professional units. The hill, which is a Scheduled Ancient Monument, had been the subject of much abuse over the centuries but the ancient earthworks were, following a systematic mowing regime, at last beginning to look more like a nationally important monument. However, travellers then arrived and for the past few years they have been parking on the monument and digging their cess pits into the earthworks. A determined group, led by this Society and Dr. Matt Pope, linked up with BHCC and English Heritage and started a campaign to have protective measures installed to prevent further damage. lt proved to be a very expensive undertaking but, with financial support from BHCC and English Heritage, a series of concrete and steel bollards have now been installed (under archaeological supervision) on both the north and south sides of Manor Road. Last September, a joint endeavour by (amongst others) Dr. Matt Pope and Archaeology South East, BHCC and the Society, resulted in an open day being held on the hill. This included a small excavation, various displays and walks led by Matt Pope around this Neolithic site. lt proved to be a very successful event with large numbers of the public and some Brighton and Hove councillors attending. This Scheduled Ancient Monument has been free of travellers since the protective measures were installed and let us hope that it remains this way. The Society would like to see Whitehawk Hill become a local park where people can not only walk and enjoy the beautiful views but read on display boards what lies beneath their feet. Alice: "lt would be so nice if something made sense for a change." Doorknob:"Read the directions and directly you will be directed in the right direction." In August the brave BHAS field team embarked upon another adventure with me, not to be put off by the previous dig at Varley Halls where we excavated a small section through a lynchet. This year's mission was to uncover a potential roundhouse which had been highlighted in a previous BHAS resistivity survey from 1992, lying directly adjacent to the MBA settlement at Varley Halls, excavated in 1992 by lan Grieg from ASE. 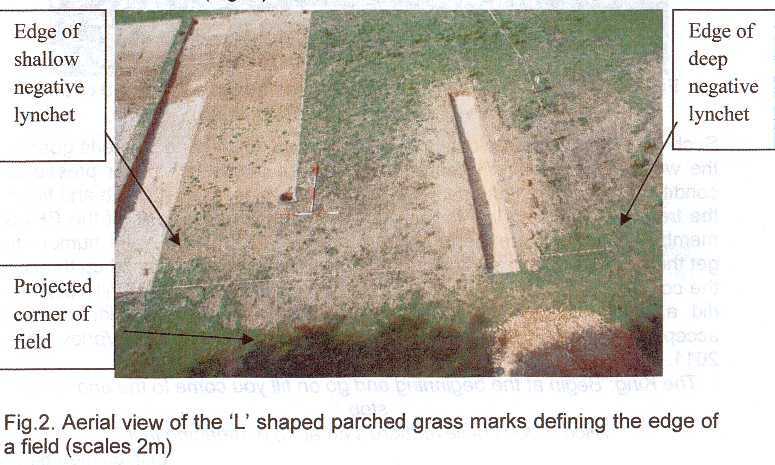 lt was hoped that other features in neighbouring fields would also be investigated by trial trenching and/or auger survey but these areas remained sterile of finds or features which is confusing, given the lovely resistivity survey results conducted in these fields. But herein lies the dilemma that we faced at VH this year; the archaeology was back to front and upside down! When we began to excavate a 12m square trench placed over the 'roundhouse' we found the majority of Bronze Age finds in the modern topsoil, with few Bronze Age finds in the prehistoric colluvium underlying the modern topsoil. So 1 surmised that the finds must be washed down slope from the field above, but this proved to be sterile, apart from a few BA finds in the modern colluvium. So where did these finds come from? Certainly not a roundhouse as sadly was the case. Upon excavation in the main trench we found that modern ploughing had stripped the site with only 20cms of plough soil before chalk bedrock was reached. The only feature we did find which was prehistoric in this trench was the edge of a field, with a very shallow negative lynchet containing in the shallow deposit of colluvium a handful of BA flint flakes, all roughly struck with no re-touch and one or two MBA sherds, which were very abraded. 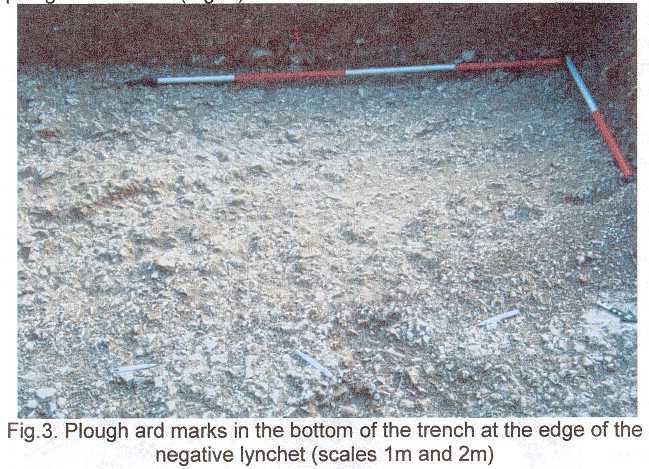 Apart from this very ephemeral feature we had a 'mystery trench' which appeared to run in aerial photographs in an arc at least 60m long (Fig.1 .). This gave us a real headache as it appeared upon initial excavation to be a lovely cut feature; we thought we had at last found a house platform but it contained mostly modern finds and two layers of re-deposited chalk. Now when excavating chalk, one would think that lt's easy to know when one has reached the bottom. Not so here, we found earth layers underneath the chalk 'natural' with another layer of disaggregated, re-deposited chalk underneath the soil which was resting on the chalk proper. Right at the bottom we found a nice sweet wrapper; the cut was nearly a metre deep at this point and so we have to concluded that this is a modern feature, probably associated with the construction of VH, neatly placed right across our main trench and not showing up in the geophysics as it was probably cut after the survey was done. We decided there was time to put one last test trench in, over the comer itself, to try to understand the relationship between the two Lynchets. This was placed, not by using the geophysics results but by eye, using the parch marks as a guide and it was bang on the money. We found yet more of the Same prehistoric colluvium, which by then had been sampled and confirmed by Dr. Michael Allen from Bournemouth University, as well as a good number of more BA flints and some nice MBA-LBA pottery. However, the most fascinating thing was on the Last day when we reached the bottom of this trench, we found a tantalising and direct connection to the Bronze Age farmers who once tilled these fields. There at the bottom of the trench we discovered some plough ard marks, Left there by the very people who had last ploughed this field (Fig.3.). Such ephemeral archaeology is very rare in this county and all credit goes to the wonderful diggers who carefully excavated this trench under pressured conditions, being the Last day we were all keen to go down the pub and finish the trench off I would like to take this opportunity to thank all of the BHAS members who did a wonderful job of putting up with my sense of humour to get the job done and in particular~ to the new members who joined up through the course of the dig, namely Bryan Darney, Chris Keeley and Will Vuill they did a grand Job. Thanks also to John for his continued guidance and acceptance of my upside down theories. Watch this space for Varley Halls 2011. The King:"Begin at the beginning and go an till you come to the end: then stop." Alice:"! don't believe there's an atom af meaning in it." On June 30th this year we concluded the excavations in the north field at Rocky Clump. The flint cobbled floor was finally excavated and a section through the floor came down onto natural geology, it was not a 'well'. The curious feature was a deliberately created depression focused on a large sarsen stone, a natural deposit located at the west end. The floor was littered with animal bone, and precious finds including coins, brooches and Roman glass vessels. The current conclusion is that it is possibly an animal butchery location. The floor continues rising in a south easterly direction disappearing under the baulk. A geophysical survey early in spring revealed new features north of the floor and a number of trial trenches revealed a new large ditch and post hole, so archaeology does continue northwards. Excavations in the east trench continued to find archaeology with large amounts of pottery and oyster shells. Steve Corbett brought along photographs from Norman Norris's report of the 1950's which clearly showed that we had been re-digging a previously excavated area that had not been recorded. The section was exactly the same as one of Norris's photographs with a pair of sarsen stones still in the same location. The amount of finds recovered from this re-excavation clearly showed that a lot of finds were missed. Further investigations within the clump failed to find any new and untouched burials. What was revealed was a flag tag from the excavations in 1993 which shows how accurate the plans are for the site. The large west sarsen was tentatively investigated and the west face does continue making this geological item quick a huge lump of rock. In 2011 the emphasis will move to the south field. lt is hoped to find evidence for the settlement at Rocky Clump associated with the farming activities found in the north field. The new excavations will be led by a new team and will be considered as a separate phase. The north field will now be written up and published. lt has been a fantastic 18 years of archaeology, and so much has been done by so many people. The excavations have been supported by countless diggers all interested and dedicated to revealing the secrets of this part of Sussex. lt has been an enjoyable experience meeting so many interesting people but now it is important to focus on getting the report written. 1 would like to thank everyone who participated in the dig and hope that they will support the new team. There is still much to seek and find at Rocky Clump and 1 am sure that excavations will continue for some time yet.